From left to right, James “Jim” Simmons b. 1923, Fannie Lee “Cooter” Simmons Foil b. 1920, Ezra “Jodi” Simmons b. 1913, an Ethel Lorena Simmons b. 1906, all children of Lucius Theodore Simmons and Annie Clarinda Knight Simmons. 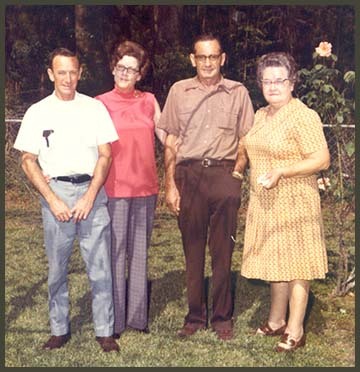 The other three children, Estus, Desera and Lloyd were deceased prior this reunion which I believe took place at the home of Ethel in Natchez, Mississippi–but I could be wrong on that! Fashion styles spread at different speeds not only geographically but even within a community so it’s difficult for me to apply a date other than “Early 1970s”. It’s easy enough to pick out the siblings in the below photo. Ethel’s husband, Esmond Edward Hennesy is the elder gentleman seated to the right with the couple of children in his lap. Aside from Esmond, I’ve not a clue who anyone else is and no one else has been identified for me. I believe I recognize Jim’s wife from a 1954 reunion picture, she’s standing to the left of him at the far right. The woman in the blue shirt standing to the left of Ethel (back, a little left of center) is Juanita Simmons, Jodi’s wife. If you have further info, let me know. Two other photos of Ezra and his wife, Juanita, taken at the same reunion can be viewed here. I know quite a few folks in this pic. Pretty sure it was taken at the Simmons Cemetery, by looking at the chain link fence. Fannie Foil, Madonna Foil Fowler, Kerry Foil (me), Most of the Jim Simmon’s Family! Uncle Ezzie and Aunt Ethel Hennesy! Front row seating from left to right is me (Kerry Foil), then I think, Aunt Ethel Knight, Uncle Wilbur’s Wife! Far right standing in white shirt is Jim Simmons Jr., Uncle Jim’s son! I see Carolyn Simmons Warren, Joyce Simmons, and their children! My sister, Madonna Foil Fowler would know just about everyone in this pic! She is big into genealogy! This brings back memories! Actually, I think this was a Simmon’s reunion held in Sheridan, LA. After examining the pic, I do believe the reunion was at Natchez, where Uncle Ezzie and Aunt Ethel lived, I think on Old Pond Road! I see my Father, Fernie Foil in the center behind my mother! We all made the trip up there to Natchez. Aunt Junita Simmons, Uncle Jim’s wife is sitting next to Aunt Ethel Knight. If I recognize any more, I’ll write! Hey, Kerry. You probably know I’m Juli, Marty’s wife (Jean’s son). Thanks for the IDs on the picture.